*This article was originally published in February 2012, and was updated in July 2013, October 2014, January 2015, July 2015, April 2016 and March 2017. The public are asking more questions than ever before about the police use of Conducted Energy Devices (CED) and what it means for policing and protecting the public. The model of CED used by UK Police since 2005 is the TASER X26, but this model is no longer in production and will be gradually replaced by the TASER X2. There are many different views on the place of CEDs in policing and it is regularly debated and discussed in the mainstream media and across social media. We believe it’s important for the public to be given the facts around CEDs to help with that discussion, which is why we have drawn up a list of the most frequently asked questions for the public and media to use. The guidance on the use of CEDs is continually reviewed to ensure it remains fit for purpose and this document will be updated from time to time to reflect any new developments. When were CEDs introduced into the UK? In 2004, following a trial in five forces, it was agreed to allow chief officers of all police forces in England and Wales to make CEDs available to authorised firearms officers for use in authorised firearms operations. In July 2007, authorised firearms officers were allowed to use CEDs in a wider set of circumstances. These officers are now additionally able to deploy CEDs in operations or incidents where the use of firearms is not authorised, but where they are facing violence or threats of violence where they would need to use force to protect the public, themselves or the subject. Also announced in July 2007 was the trial in 10 police forces of CED deployment to non-firearms officers facing similar violence or threats of violence. These officers are referred to as Specially Trained Officers, or STOs. The 12 month STO trial commenced on 1 September 2007 and ended on 31 August 2008. It took place in the following forces: Avon & Somerset, Devon & Cornwall, Gwent, Lincolnshire, Merseyside, Metropolitan Police, Northamptonshire, Northumbria, North Wales and West Yorkshire. Following the success of the trial, from 1 December 2008, CED use was extended to STOs. On 2 March 2017, following a comprehensive assessment by an independent medical committee, government scientists and the police, the Home Secretary authorised the use of the TASER X2. Is every police officer given a CED? Every chief constable makes a decision, based on an assessment of the risks in their own area, to train and deploy a proportionate number of officers to use CEDs so that the public are kept safe and police officers are protected as far as possible. Every use of CED is reported and scrutinised and officers are individually accountable to the law for the amount of force they use. Not everyone will be accepted for training in the use of CEDs. A minimum standard for all CED trained officers is that they must be police first-aid trained, pass an eyesight test, pass a professional standards record check and be officer safety trained (with knowledge of, and training in, law, self-defence and restraint). What does CED ‘use’ mean? In the UK, use of a CED does not necessarily mean that electrical discharge is delivered to a person. Because we recognise that the mere availability of a CED at an incident can help to defuse the situation, we differentiate ‘use’ into seven types: drawn, aimed, arced, red dot, drive-stun, angled drive-stun and probes fired. The first four types of use do not deliver electrical discharge and comprise the majority (about 80%) of uses by UK police. In the remaining 20%, the majority involve fired probes. Use in one of the drive-stun modes comprises about 1%. Why use CED at all? CEDs provide an additional option to resolve situations, including the threat of serious violence, which can come from any section of the public. In certain circumstances the use of CED is more appropriate than other options in resolving dangerous situations safely and with less risk of serious injury. In addition, officers who are trained and equipped with CED must decide on the most reasonable and necessary use of force in the circumstances. The level of force used must be proportionate to achieve the objective and officers are individually accountable in law for the amount of force they use on a person. The alternatives to CED include a range of other measures such as physical restraint, batons and police dogs. Much will depend upon the circumstances, but CEDs will often be less injurious than resorting to baton strikes or employing a police dog. In the majority of cases involving CED, the mere threat of its use has been enough to defuse a situation and ensure a peaceful resolution of the incident. What happens to someone when a CED is used on them? The normal reaction of a person exposed to the electrical discharge of a CED is pain, coupled with the loss of voluntary muscle control which can result in the subject falling to the ground or freezing on the spot. Recovery from these effects should be almost instantaneous once the discharge turns off. Anyone who is arrested after being subjected to CED discharge is examined by a medical professional. After a CED is used on someone, are the medical implications taken into account? Yes. The medical implications associated with use of CEDs are closely monitored by an independent panel of medical and lay advisers who also monitor learning from across the world. This enables continuous review of the guidance to ensure that it remains fit for purpose. In addition, the Authorised Professional Practice (APP) is supported by a detailed training curriculum which is delivered to all CED officers; these officers also receive an annual refresher course. The APP is available to view on the College of Policing website: https://www.app.college.police.uk/app-content/armed-policing/conducted-energy-devices-taser/ . Officers are trained by their own in-force trainers. All forces have a Lead Instructor (some having more than one) who is trained by a small team of National Instructors governed by the College Of Policing. What happens if someone is on drugs when CED is used on them? Drug use, including excessive alcohol use, is a common cause of violent, dangerous and unpredictable behaviour, and CED can be a useful tool in safely subduing intoxicated people who might otherwise be difficult to restrain. Other more traditional restraint methods can lead to injury to both the person and officers. If a person is severely intoxicated, their response to CED discharge or, indeed, any other use of force, may be different from someone who is not badly intoxicated. Irrespective of which type of force is used on a person, if officers become concerned with a person’s welfare they must take urgent action, which may include rapid transfer to hospital, if necessary. What happens if someone with a heart problem or other medical condition has a CED used on them? Officers won’t always know the people they are faced with or be aware of their medical history. The officers still have to deal with the circumstances presented to them. Some people who are violent may have a condition that they themselves are unaware of. What is important is that the officer deals with any threat in a proportionate manner and only uses the type and degree of force that is necessary in the circumstances. If an officer becomes concerns with someone’s welfare, they will treat it as a medical emergency and get the person to hospital as fast as possible. What happens if someone has CED used on them more than once? Sometimes a longer period of CED discharge is needed when a person continues to be violent after the initial discharge. People who have taken illicit stimulant drugs can fall into this category. However, CED officers are trained to always use the minimum duration of discharge necessary to bring a violent situation to a close. Usually a single 5-second (or shorter) discharge is sufficient. Why has there been an increase in the numbers of uses of CED? CED use across the UK has increased due to more officers being trained and more CEDs being deployed on the streets. This expansion has been carried out in a structured way within each force area. The comprehensive training packages, governance and monitoring are in place and the availability of CEDs is documented in each force area’s strategic threat and risk assessment (STRA). CED deployments across the UK, as well as the training and governance measures in place, are monitored by the National Less-Lethal Weapons secretariat, which is led by Deputy Assistant Commissioner Lucy D’Orsi. Why have CEDs got a bad reputation when police say it’s so good? This is a complex question. Other countries have deployed CED in circumstances that some may see as questionable. This has resulted in negative press coverage and public concern has been raised through human rights groups such as Amnesty International. There is no doubt that, internationally, a number of deaths have occurred in association with CED use. However, the role that the CED played in these deaths is often disputed, with coroners citing serious underlying medical conditions, drug use, or other force used by the police as being causal or contributory to the deaths. When dealing with seriously violent people, the police recognise that many types of force carry risk, and these include physical restraint, baton strikes, impact rounds, police dogs and irritant sprays, as well as the CED. Nevertheless, perhaps partly because the CED works ‘mysteriously’ by injecting electrical pulses into the body, the device has become highly controversial. CEDs offer the police a means of bringing a situation under control from a safe distance. In the main, the effect of CEDs is more consistent and predictable than many other types of force that the police might need to use. It is for these reasons that the police find the CED a useful option to have. Only firearms officers and other specially selected and trained officers are permitted to carry and use CED. Why are CEDs used in custody areas? Custody is a secure environment! Why is CED used on people who are mentally ill or who are vulnerable? CED is used in situations of violence and potential violence. Police have a duty to de-escalate events to try to stop situations from turning violent in an effort to protect the public and themselves. On 80% of occasions when officers are presented with violence or potential violence, the mere presence of the CED is enough to bring that situation to a swift conclusion without the need for physical force to be used. In such dynamic situations, officers aren’t always going to know the person’s background or medical history. It is in these instances that officers use their experience and training to make a decision on what use of force option to adopt. If immediate action is needed and a CED is deployed, following the situation calming down, officers will make sure the individual is given immediate medical attention if needed, which includes hospital transfer if necessary. The priority is to remove the risk the person presents to themselves and others with the least intrusive options. Can CED be used on children? There is no lower or upper limit on the age of the person that CED can be used upon. However, officers are taught that there may be an increased risk of cardiac arrhythmia and probe dart penetration in children and thin adults. A child is classed as someone under the age of 18, but a lot of violent crime is carried out by people who meet the criterion of being ‘under 18’. A survey of CED statistics in London revealed that only a few people under 18 had the device used upon them, and they were involved in violent crime, were armed with weapons, and so on. An officer has to justify their use of CED to the standard of the criminal court. CEDs may be used in such circumstances and can be less injurious than a baton strike or other types of force. As noted earlier, only 20% of cases result in the CED being fired. Drive-stun refers to when electrical discharge is delivered by pressing the front end of the CED against a person. There are two types of application: drive-stun and angled drive-stun. Applying drive-stun with the TASER X26 can be done either with the cartridge removed or with a used cartridge in place (that is, when probes have already been fired from the cartridge). Drive-stun cannot be used when there is an unused cartridge fixed to the TASER X26. Drive-stun discharge is delivered from two contacts (electrodes) in contact with the skin or clothing. These contacts are about one-and-a-half inches apart and must be pressed against the subject’s clothing or skin to have an effect. When used in this way, the discharge will deliver only a painful local shock to the subject with minimal, if any, muscle involvement. This will cause them to recoil away in discomfort. In this mode of use the CED does not incapacitate an individual (unlike when the probes are fired). Drive-stun is probably the least effective and most complained about use of CED across the world. When drive-stun is used, the electrodes and electrical current can leave temporary marks on a person’s skin. These marks can include skin reddening, electrical burns and physical injury from the metal electrodes scraping against the skin. The UK police do not teach drive-stun as a routine option during the training courses, but officers are shown how this could assist them in emergency situations, where use of the preferred method (fired probes) is not an option. When CED probes are fired they can sometimes contact the subject with too small a separation. When this happens, incapacitation may not be achieved. At other times, one of the two probes fired from the CED may miss the subject entirely, in which case no electrical circuit is made, the discharge will not be delivered and there will be no incapacitation. When either of these events happens, cartridge-on angled drive-stun can be used. This is where the officer follows-up the probe shots by pressing the front end of the CED against a part of the body at a suitable distance from the where the probe (or probes) made contact. In this way it becomes possible for incapacitation to be achieved. Unlike the TASER X26, the TASER X2 can deliver drive-stun without the need to remove the cartridges. We anticipate that there will be fewer instances of use of drive-stun or angled drive-stun with the new device. If this proves to be the case, this is likely to be due to the TASER X2’s two cartridges, which gives the ability to rapidly follow the first probe shot with a second probe shot. The dual laser sighting system of the TASER X2 should also improve the reliability of achieving incapacitation when the first pair of probes is fired. Are complaints involving CED taken seriously? Yes. All complaints about police activity are taken seriously. In the case of CED, any complaint that is made is recorded and investigated by the force concerned. In the rare case of a death or serious injury, which can occur in association with the use of any type of force, it becomes mandatory for the force to refer the matter to the IPCC. The IPCC will then conduct a thorough independent investigation. This is only guidance, and the perceived involvement of CED in a complaint will be recorded and investigated thoroughly. How are officers selected to become CED officers? All officers involved in CED training have to satisfy a minimum requirement. Some forces may introduce other requirements including raised fitness levels depending on an officer’s core role within that police service. The STO is a constable – or equivalent agency rank or grade – who is trained in the use of CED, but who is not a Special Constable. The CED user should possess sound judgment, a knowledge and understanding of the National Decision Model (NDM) to resolve incidents involving conflict, have demonstrated maturity of action in the workplace, demonstrated an ability to use legitimate force in a proportionate manner and have an acceptable Professional Standards / Complaints and Misconduct record. (There is no requirement for psychological profiling to be used for selection.) This will be signed off by an officer of at least the rank of Superintendent. The CED user is expected to undergo a biennial eyesight test to the same level as authorised firearms officers. demonstrate understanding when dealing with vulnerable persons. The CED user will be required to successfully complete annual refresher training of 6 hours minimum contact time. If found not to be competent during re-training then re-accreditation must take place or they will cease to be a CED User. The CED user must demonstrate safe systems of work for the loading, unloading and function checking of the CED, report any faults or failures to CED single point of contact or technician and will maintain competence to the national minimum standard in both first aid and officer safety training. This must include training in dealing with people showing signs of an extreme and possibly life-threatening condition known as Acute Behavioural Disturbance or ABD. How do forces monitor CED use? Police forces record and monitor all CED use. Have a well identified and experienced single point of contact within force who can represent that force at National meetings. Have a credible and well-informed CED lead. This person may be the force’s Chief Officer lead with responsibility for less-lethal weapons. Have a flow of information with the national Less-Lethal Weapons secretariat who will act as a critical friend for support and guidance. There are experts within the secretariat. Why does CED use vary greatly from force to force? Forces deploy CED in response to their threat and risk assessment. This can reflect local variations in the demographics of violent crime and violence towards officers. Some forces will deploy CED with units that are specifically set up to deal with confrontation. This will mean there is a greater likelihood the CED will be used more frequently than other forces that deploy CED with officers who perform a general duty. What is important is that each use must be justified within the law and supervised within the force itself. If this isn’t happening there are safeguards at a National level that allow this to be investigated further. CED has killed people. How can you say it is safe? All use of force carries risk and the use CED is closely monitored. The introduction of CED into UK policing followed a comprehensive review and study by an independent medical committee (the Scientific Advisory Committee on the Medical Implications of Less-Lethal Weapons, or SACMILL). To date there have been no deaths in the UK that have been attributed to the direct electrical effects of CED on the body (for example, the electrical discharge directly affecting heart rhythm). There has been an instance where CED use resulted in death from a secondary effect of the discharge (ignition of flammable fuel) and one occasion where a Coroner’s court concluded that the use of a TASER CED contributed to a person’s death along with a series of other factors. The inquests on six further UK deaths where the use of a CED featured have yet to reach a conclusion. Deaths from head injury as a result of discharge-induced falls, have been documented in other countries and there has been at least one incidence of serious head injury in UK use of CED. Risks are reduced as far as possible by robust training, governance, engaging with communities and learning lessons by monitoring of use and sharing knowledge. How do officers make a decision to use CED? Officers use the National Decision Model (NDM) when arriving at a decision to use force. The National Decision Model is a police framework that officers are taught to enable them to make considered and consistent decisions. 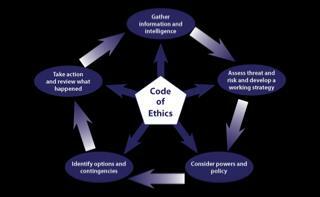 It is to be used by all officers, decision makers and assessors that are involved in the whole decision process. It is not only used for making the decisions but for assessing and judging them. It can also be used to improve future decision-making and help to create and refine techniques and methods for many situations. Officers will look at each individual case and decide on the most appropriate tactical option that is in line with the law and is proportionate and necessary in the circumstances. CEDs have been called '50,000 volt stun guns'. Are people shocked with 50,000 volts? It is true that CEDs generate 50,000 volts to produce the spark discharge (known as ‘arcing’) across the electrodes at the front of the device. This high voltage is also required for the passage of electricity across the air gap between the CED probes and the skin when the probes are caught in clothing. However, once the electricity contacts the body, the voltage drops to about 1,500 volts. The TASER X2 produces less electricity than the TASER X26 (amps and voltage) and has the ability to lower the quantity of electricity if there is a good connection. The reason 1,500 volts does not injure people is because it is delivered in extremely short pulses, with each pulse lasting about 1/10,000th of a second. This is similar to the static shock you might experience touching a metal tap on a dry day after walking across a carpet; even though voltages can be as high as 20,000 volts, the static shock does not injure because of its extremely brief duration. The extremely short 1,500 volt CED pulses are not to be confused with the continuous 240 volt mains electricity voltage, which may be fatal. How can police be confident that the right amount of current comes out of a CED? The manufacturer carries out thorough tests on all of its CEDs, which are guaranteed by an internationally recognised quality assurance body to ensure they meet operational specifications before they are supplied. CEDs are also regularly checked to ensure they are functioning correctly. When CED pulses are applied to body, either through clothing or directly on the skin, electrical current flows. This current activates nerves under the skin which then cause muscles to contract. When this happens, the contractions produced by the CED override a person’s ability to make voluntary movements – the person will not be able to run away or physically attack someone. This muscular incapacitation only continues for as long as the CED discharge is applied. The passage of electrical current is also very painful, and this may also contribute to the incapacitation effect. Is it true that police plan to introduce a new type of CED? After a lengthy assessment, the Home Secretary has authorised the TASER X2 for use. Scientists, an independent medical committee and police experts have been assessing the device to gauge its fitness for operational use in the UK.The current model of CED, the TASER X26, is still a valid device and will continue to be deployed across the UK in parallel with the TASER X2. If the current CED works, why do we need a new one? The police service is legally bound to explore alternatives to lethal force and continuously reviews new technology to see whether there are any developments that could be applied in UK policing. The TASER X26 has been commercially available since 2003, and has been in use in the UK since 2005. As with all electronic devices, technology moves on and new models may offer some advances in safety, use and accountability. All equipment has a finite life expectancy and will require eventual replacement. The TASER X2 will complement the TASER X26 and, in time, will replace the older single cartridge device. The TASER X2 also offers some technological advantages, such as enhanced data collection, which will provide more detailed information to develop training and tactics and increase police accountability. There has been some concern about CEDs being used on the chest. Why do police aim there? CED does not work by electrocuting people, rather they cause incapacitation by stimulating nerves which, in turn, make muscles contract. Due to this, the CED is most effective when it is targeted at large muscle groups, such as the back, thighs, abdomen and buttocks. These muscles are also largely responsible for posture so can be more effective at stopping a subject posing a threat to the public or police. As is often the case with frontline policing, an individual posing a threat is unlikely to stand still and allow a police officer the choice over where the CED is aimed. Things can change rapidly in dynamic events such as these. The situation is further complicated by the need to avoid sensitive areas of the body, such as the eyes, face, neck and groin. If a combative individual attacks an officer face-on, then the reality is that the only area that the officer may be able to hit with the CED probes, while at the same time avoiding sensitive areas, is the chest. Officers are not trained to aim at the chest as this is thought to less effective than other areas of the body due to the smaller muscles that are not involved in regulating posture. However, the operational reality is that, where a subject is rapidly closing down on an officer and posing a threat to the officer or the public, the narrow window of opportunity may mean that the chest area is all they can see and, therefore, aim at. No use of force is risk free, but the alternatives to CED, when an individual poses a serious threat, include physical restraint, batons, police dog, impact rounds and, in rare situations, lethal firearms. These alternatives can have a much more long-term impact on someone compared with a CED, the effects of which last only for the duration of the discharge. In September 2009, TASER International announced a change to the recommended point of aim for CED shots to the front of the body. This change involved avoidance of shots to the chest. The company went out of their way to say that this change was not because they had new evidence that such shots to the chest affected the heart. Rather, they said that it avoids the controversy about whether or not discharge from the device does actually affect the heart. In the UK, as a result of the announced change, the Government’s independent medical committee was consulted. The committee concluded that, at the time, there was no new evidence to indicate a direct effect of CED discharge on the heart and that the risks of using the device remained low, a position supported by operational experience of use of the CED in the UK. Subsequently, some new evidence did emerge in a human study that was published in a medical journal in 2010. In this study a single subject experienced a fast heart beat when the CED discharge was applied to the front of the man’s chest and returned to normal when the device was switched off. The probe had penetrated the skin and underlying tissue and was closer than usual to the heart. Although the device that caused this was not a commercial product (it was prototype of a new design), the independent medical committee took the view that it would be prudent to assume that the current CEDs may carry a similar risk. The committee further advised that if it turned out that this risk was real, then it could be averted by avoiding shots to the chest area over the heart. However, it noted that the overall risk of using CED remained low. Officers are currently trained to aim the CED probes so as to “split the beltline”. In practice, for frontal shots this means trying to place one probe in the upper abdomen and one probe in the upper thigh. However, for the reasons given earlier, this is not always possible in a rapidly changing situation and upper frontal chest probe placements will inevitably occur. Is it true that after every use of CED the officer must record where on the body it was used? The location of the probes on the body is one of the pieces of information collected in the CED Deployment Form every time a police officer in the UK uses a CED. The most recent version of the form allows the officer to record, on a human-shaped figure, frontal shots impacting on the chest area over the heart. This form, which was introduced in 2012, replaced previous versions which considered the frontal chest and abdomen as a single entity – there was no option t orecord probe placements over the heart. In the event of any unexpected event occurring during use of the CED, the current form allows the police and others, such as the independent medical committee, to begin to explore whether there may be a link between probe position and the event. For more than ten years, CED has been successfully and safely used thousands of times in the UK to protect the public and officers. Whilst there have been several deaths following CED use, of those enquiries that have reached a conclusion to date, the CED was found to be responsible in one (the electricity had ignited flammable fuel that the person had poured on himself). In one other case, it was concluded that the stress of the discharge, along with multiple other stressors (including physical restraint), jointly caused the person’s death. It has been said that officers using CED receive training for only three days. Is that enough? The CED training package in the UK is one of longest and most comprehensive in the world. The training has been developed by an experienced group of CED instructors and practitioners and is subject to regular update and review. As well as reviewing the training, any police officer who applies to become CED trained must undergo a thorough selection process and not every officer who applies will be successful. In order to pass the training, officers must have an established history and training in the use of force and decision making, have officer safety training and first aid competence. CED training then builds on this existing training and experience. The initial training module is 18 hours, spread across three days. However, the total training an officer receives to become a competent CED user is significantly longer when all of the prior training they have received is taken into account. Typically, in other countries CED training is achieved in one day, whereas the UK’s package is three times longer and demands that officers already have the skills and competencies mentioned above before they are allowed to undertake CED training. But why don’t CED officers get the same amount of training as firearms officers? A comparison between CED training and firearms training fails to account for the significant difference between the two roles. The standards within CED training are as thorough and robust as firearms training, but the length of the course for firearms is naturally longer because of the complexities and tactics used. CEDs are laser sighted and simple to load and reload. They can also be used at close ranges (for example, in confined spaces). This compares with a handgun, which uses a conventional sighting system and is used over a greater variety of ranges and positions and has to integrate with a far more complex range of tactical options. As a result of these differences, it takes more time to train and assess an officer’s ability with a handgun. As the skills required to use a CED are far simpler by comparison with a handgun, the re-examination and training of officers is naturally different. CED training concludes with a robust assessment process that will eliminate officers who do not meet the required standard. Once officers pass this training, they are then assessed every year and, if they do not meet the requirements, they will no longer be allowed to continue to deploy with a CED. It must also be remembered that the length of training is not the best way to judge someone’s ability. Ultimately, it is not about how much training an officer has received, rather it is the standard they must achieve and maintain. Are police officers the only users of CEDs in the UK? In addition to the police forces in England, Wales, Scotland and Northern Ireland, the British Transport Police, Ministry of Defence Police, the Civil Nuclear Constabulary and the National Crime Agency also have personnel who are authorised to use CEDs. There are also authorised CED users in the police forces of Guernsey, Jersey and the Isle of Man. All of these authorised CED users are trained and accredited to deploy with CEDs in the same way, leading to a consistent approach across the UK and Crown Dependencies. This consistency is also ensured by the NPCC Less Lethal Weapons Working Group supported by the NPCC LLW secretariat. What is the NPCC Less Lethal Weapons Working Group and what does the secretariat do? The secretariat provides a Joined-up strategic approach to police use of CED. It oversees authorised use of CED by police forces throughout UK and Crown Dependencies, as well as other authorised users including the National Crime Agency. Group comprises of representatives and special leads from police forces who attend the meetings, as well as the Home Office, College of Policing, Centre for Applied Sciences and Technology (CAST), Defence Science and Technology Laboratory (DSTL), the medical oversight body SACMILL, and is chaired by Deputy Assistant Commissioner D’Orsi, the NPCC Lead for Less Lethal Weapons. The role of the secretariat is to discuss matters of common interest concerning use of CEDs by police, which include recording procedures, public engagement, and maintaining standards of CED use across forces. The secretariat communicates out to all authorised user groups by providing national circulars and a range of other information.